The story of the Tokpah family is a sad one. In a recent news article written by Benno Muchler in April 2015, the Tokpah family was highlighted as having been especially affected by the Ebola outbreak in their community. Locals say Ebola came to Ganta at the end of July when John Wolobah, a street vendor, visited family in Lofa county and came back sick. He went to a clinic, was released. Later that day, a woman named Roseline Tokpah went to the clinic with her sick, pregnant daughter. The daughter used the same bed as John Wolobah. Tokpah stayed next to her. Wolobah died, as did Tokpah and 14 members of her family. Roseline Tokpah’s house is in the poor Small Ganta community, surrounded by tall, old mango trees and fields. Ebola divided Small Ganta along the main road. The side of Roseline Tokpah’s house was the Ebola zone. The other side remained Ebola free. People only started crossing back in November. The pregnant daughter mentioned in the story is Princess Tokpah, who contracted Ebola and survived. Despite being pregnant, she stepped forward to care for her younger siblings, nieces, nephews, and cousins who also lost their parents to Ebola. Princess was introduced to Africa Heartwood Project through Karen Mathot, who learned of their plight from some missionaries living in Ganta who saw the need and wanted to help. A meeting was held at a church in Ganta where children were identified and a plan was put into place to provide support to Princess and the children in her care. 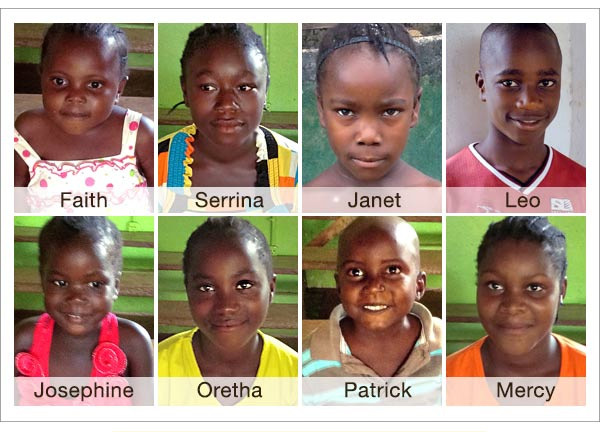 Princess, Serrina, Mercy and Janet are all siblings. All of the children witnessed the death of family members and friends in Small Ganta, where they were also stigmatized for being part of the family that brought Ebola to the community. Houses were burned and associations were restricted because of the fear of the disease and the unknown nature of how it is contracted and spread. While the Heartwood Orphan Home is more like a family than an institution, we strongly value the long-term relationships of the children to family members in their home communities. It is our intention to provide regular opportunities for the Tokpah children to remain in contact with family members and friends in Small Ganta, most especially with Princess. We are grateful to be in a position to make a lasting impact in the lives of these eight children who have lost so much. Janet, who is deaf, will need to go to a boarding school where she can learn to speak ASL and where she can become a part of the deaf community support system in Liberia. Let there be hope. Let there be love. Let there be life.